From analyzing assets to planning for retirement, this new edition of Personal Finance Workbook For Dummies gives you the information and resources you need to get your finances under control. Personal Finance Workbook For Dummies walks you through a private financial counseling session, using worksheets, checklists, and formulas for assessing financial health, providing for day-to-day financial management, making wise financial decisions, and investing for financial growth. 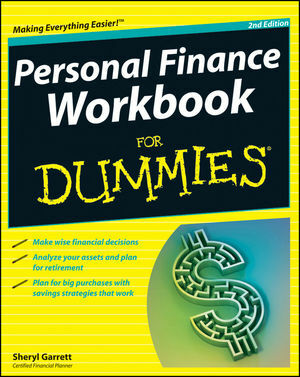 From budgeting and cutting expenses to getting out of debt and planning for retirement, Personal Finance Workbook For Dummies is a solution for those looking to avoid bankruptcy as well as those looking for something to help them plan for a successful financial future. Sheryl Garrett is a Certified Financial Planner professional and founder of The Garrett Planning Network, Inc.